Books have always been my companions, mis amigos, my teachers. So it is not surprising, living as I do part-time in Walton, that I have become a disciple of the Hobart Book Village, a cooperative that began life eleven years ago and is now a destination for local and not-so-local bibliophiles. The Book Village is also a font of literary and writerly activity, like the Festival of Women Writers, which for three years has made Hobart a go-to place the weekend after Labor Day (save Sept. 9-11, 2016 on your calendar). This spring, a new bookstore will join the cooperative, bringing the total to six. And two new restaurants, including a British-style pub, are slated to make their debuts on Main Street. One snowy Sunday afternoon last January, I drove to Hobart with my husband to browse and buy, and catch up on Book Village news. Bookstore hours can be irregular from Columbus Day until Memorial Day weekend, but Diana Adams was sitting behind her desk at Wm. H. Adams’ Antiquarian Books, the cozy three-story shop at 602 Main Street which she and her husband, Bill Adams, tend with loving care. Diana reports that 2015 was the store’s strongest year in terms of sales, and August its best month ever. The book addict can trawl the Adams’ unique collections of classic Greek, Latin and English texts, theology, New York State history, art, natural history and science. After Columbus Day, Diana and Bill host a Winter Respite Lecture Series, and always there is a warming (free) cup of tea for anybody who stops by. Up the street at 678 Main is the cooperative’s largest emporium, Liberty Rock Books, with 3,400 square feet of retail space for children’s books, art books, a Native American section, avant-garde 20th-century literature and 40,000 vintage postcards from the treasure trove of collector Carlton F. Bloodgood. There is also a bright, inviting room where John Mahoney, the proprietor, organizes readings and book-signings for Delaware County’s ever-growing number of authors. The book business has been a bit tough lately, Mahoney told me. The building required a new roof, which, at $64,000, was about $60,000 more than budgeted. And income, even during peak summer months, does not always cover the expense of keeping the huge building open or investing in hard-to-resist collections (Liberty Rock currently has about 80,000 volumes in storage). 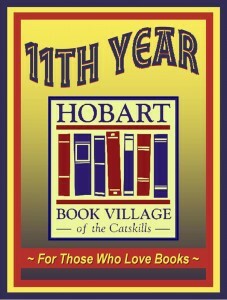 But Mahoney and Diana Adams believe that several planned additions to the Hobart environment will bring more visitors to Main Street and more potential customers for the Book Village. In April, George and Kathy Duyer, who moved to Hobart in 2014 from Washington, D.C., plan to open Creative Corner Books at 607 Main (formerly Around the World with Books and Cooks). The new store’s tagline will be “Books for Cooks and Crafters,” and the Duyers intend to sell new, used and vintage cookbooks, plus books about needlecrafts, jewelry-making, paper crafts and woodworking. And speaking of cooking…a new restaurant, The Dinner Plate, is slated to open this spring in the historic Hobart Inn. And Oliver and Melissa Pycroft—he’s a Brit, she’s an American who lived seven years in London—have bought an 18th-century Colonial on Main Street and are transforming it into an inn and pub, The Bull & Garland. The Pycrofts are aiming to open their taste-of-England-in-Hobart by Memorial Day weekend, just in time for the first of the Book Village’s grand, semi-annual sales. To borrow from George and Ira Gershwin, who could ask for anything more?